ASHBURTON, 13 March 2019 - Ashburton District Council is getting behind a new water safety campaign in a bid to help prevent toddler drownings in Mid Canterbury. The Council, together with Water Safety New Zealand and local irrigation companies, MHV Water, Barrhill Chertsey Irrigation, and Ashburton Lyndhurst Irrigation Limited, is pushing the importance of adult supervision around water, especially in rural parts of the district. In the last 10 years, there have been 58 preventable toddler drownings in New Zealand. As a vibrant farming community, the Ashburton District has many water races, irrigation ponds, streams and rivers, most of which are not fenced or restricted, and many are often on private properties. These waterways can pose a deadly threat to unattended children," Ashburton District Council Chief Executive, Hamish Riach explained. "It is not realistic to expect every waterway in rural areas to be fenced. With so many potential drowning hazards around, it is vital that everyone is keeping a vigilant eye on their young ones at all times. The Council is proud to be working in partnership with local irrigation companies and Water Safety NZ to help reinforce this crucial message." 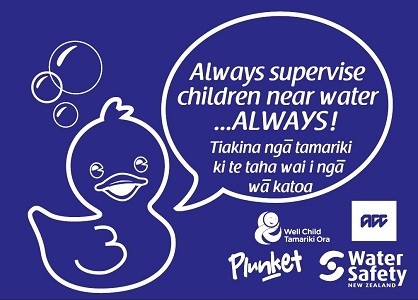 This water safety video campaign features local residents delivering key messages on keeping children safe around water, with a focus on adult supervision. It highlights local environments and encourages people to take note of where waterways are, particularly when visiting farms or unfamiliar rural areas. These key messages are built on the fact that it can take less than one minute for a child to drown. People are encouraged to share the video with their networks on Facebook and/or YouTube to help get this message out to as many people as possible. Original generation time 1.5238 seconds. Cache Loaded in: 0.0004 seconds.